Highlighting lush, layered flavors, bright acidity and impeccably balanced French oak, Migration is dedicated to crafting wines from the finest cool-climate winegrowing regions. This dedication led us to establish our estate vineyard in the heart of the legendary Russian River Valley. This wine is a selection of the best blocks and barrels of wine from this exceptional site. With notes of citrus blossom, white flower and stone fruit, this wine is layered with flavor and aroma while light and refreshing on the palate. 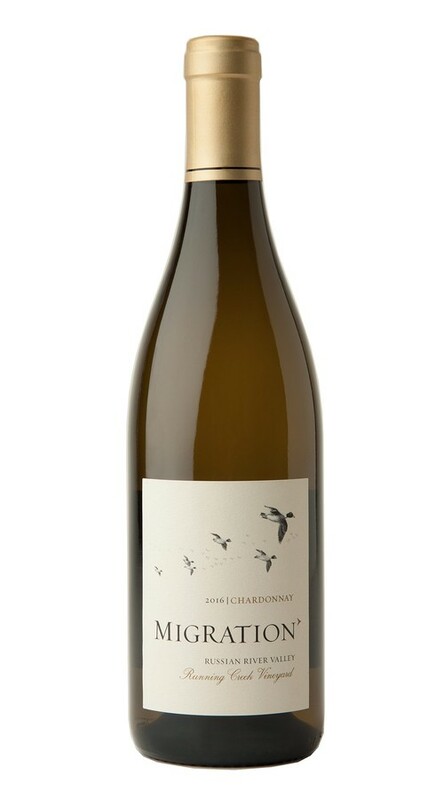 The excellent 2016 growing season resulted in a gorgeous expression of Chardonnay from our Running Creek Vineyard in the Russian River Valley. On the nose, alluring wildflower aromas mingle with notes of peach, citrus, pineapple and a touch of honey. The inviting citrus and stone fruit elements continue on the palate, where they are supported by bright acidity, hints of sweet, toasty oak and a creamy, mouth-filling texture. Harvest 2016 was another banner year for wine quality in the Sonoma Coast. Though budbreak was early due to warm weather in February and March, a cool spring led to delayed flowering and some shatter, lowering yields compared to the previous three vintages. The combination of an early budbreak and a moderate-sized crop led to one of the earliest harvest start dates on record. Though harvest was early, ideal temperate weather in the run-up to harvest resulted in wines of exceptional concentration and purity.